LifterSlip™ offers a simple solution to the problem of hybridization non-uniformity. An innovative raised edge design provides separation and allows for even dispersal of hybridization solution between the DNA chip and coverslip. LifterSlips™ allow for increased data quality by eliminating gradients caused by floating standard coverslips on hybridization solutions. The printed bars allow for easy injection of hybridization solution under the pre-positioned coverslips. Capillary attraction ensures that LifterSlip™ stays in place. Depending on size and design configuration LifterSlip™ can hold a range of volumes. LifterSlip™ is #2 thickness (0.20-0.22 mm) and the bar height is 0.04-0.06 mm. mSeries LifterSlip™ are manufactured from 1mm thick glass specially drawn for flatness and superior surface quality. The 1mm thickness has increased stiffness that reduces variation in hybridization fluid volume. Precise ink printing provides an innovative raised edge design for consistent dispersal and easy injection of hybridization solution under the prepositioned lifterslip. Premium substrates for microarray™ is used on a standard microscope slide 1 x 3", selective glass. All of the following slides are pre-packaged in a secure, no-contact mBox™, then vacuum-sealed in a foil barrier bag prior to shipping. Each package contains 20 slides. A premium substrate ready to coat with your chemistry. UltraClean™ substrate provides users with a pristine glass surface which can be used in any coating process compatible with glass such as silanization and polylysine. Manufactured from the highest quality low fluorescence glass. UltraClean substrates are manufactured in a precise and controlled process incorporating HEPA filtration. This ensures a clean and consistent surface for optimum performance in microarray applications. SuperChip™ Aminopropylsilane coated substrates are designed for microarrays fabricated with the PCR products as probes. Manufactured from the highest quality, low fluorescence glass, SuperChip features a consistent, superior surface coating to provide a uniform DNA immobilizing surface. The result is the slide that binds an optimal amount of probe while minimizing nonspecific binding of labeled targets assuring high density of reactive groups and eliminating virtually all surface artifacts. These SuperChip substrates are compatible with commercial microarray spotting and detection system. The SuperChip cleaning and coating process is tightly controlled in a HEPA filtered environment. Quality control includes contact angle and background fluorescence measurement of representative samples. Using premium select, low fluorescence glass with a consistent uniform coating of poly-L-lysine these slides yield a dense layer of amine groups for initial ionic attachment of the negatively charged phosphate groups in the DNA backbone. The DNA can subsequently be attached covalently to the slide by either baking or by UV irradiation. Our aging and packaging techniques ensure a product with a shelf life in excess of 6 months. Each lot is tested for background uniformity prior to shipping. The slides arrive ready for spotting – no pre-washing required. BioGold® substrates offer a high level of microaray performance through the use of a specialized thin-filmed gold coating. 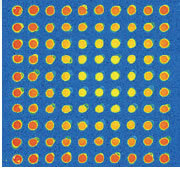 This specialized gold coating improves the adhesion of biological active cells to the substrate while its background reflective properties provide significant optical advantages for the detection of each cell's unique light-wave signature. NUNC MaxiSorp plates have been the certified* ELISA plate industry standard for years. This same surface now sets a new standard for protein multiplexing.